There’s scant few who don’t know the story of Robin Hood. Robin Hood steals from the rich to give to the poor. Now, moviegoers have another telling of the Robin Hood story. Set in the distant past, Robin of Loxley (Taron Egerton of Kingsman) is drafted into a war that seems eerily reminiscent of the war in Iraq. Proclaimed to be dead by the Sheriff of Nottingham (Ben Mendelsohn), Robin returns to find Loxley decimated. The Sheriff is taxing citizens to the breaking point. And there’s no one standing up to the evil man. There was quite a bit to like in the new Robin Hood movie. The action spurred the movie on. You never felt a dull moment. The characters were decently developed and I felt for Robin as he returned from battle (and death) to discover the love of his life, Marian (Eve Hewson) had moved on and started a relationship with Will Scarlet (Jamie Dornan). And still, there were things about Robin Hood that didn’t settle well with me. The main issue being Marian’s affair with Robin when he returned. This relationship didn’t feel right. It wasn’t right. And nothing was really said about the affair until you discover what happens to Will. The other issue I had with Robin Hood was the attack of the wealthy in the movie. Robin Hood began to feel like an attempt to show contempt and disdain for the rich while trying to make money off of the common person watching the movie. Despite these issues, I really enjoyed Robin Hood. It held my attention. There were also plenty of leadership lessons in Robin Hood. We’ll be discussing those in the latest Reel Leadership article! Robin of Loxley appeared and began to chat with fair Marian. She told Robin why she was stealing the horse: A neighbor had lost their horse and he needed the horse to continue his livelihood. At this point, Robin had a choice to make. He could have Marian arrested or he could give Marian the horse. He chose to understand the plight of Marian’s neighbor and told her to take the horse. Great leaders know there are rules in place to make things run smoothly. They also know there are times leaders need to be understanding. They have to look at the current situation as a whole and make a value judgment. You can be understanding as a leader. You can make exceptions to the rules when situations dictate a kind heart. Be willing to feel empathy for those you lead. What we are born into isn’t always who we are. This Robin Hood movie places Robin of Loxley in the lap of nobility. He was born into a royal family. As such, he had many opportunities open to him. However, avoiding a war draft was not one of those. The draft caused him to become a commoner. In war, he no longer had the privilege of nobility. Everyone was the same. Many times people are born into a situation, good or bad. Some leaders were given the opportunity to lead because their family line contained great leaders. Others were born into poverty and believed they must stay there. However, this isn’t the truth. A family line of leaders will not make you a leader. A family of criminals and degenerates will not make you one of those. You can choose what you become in life. Don’t let what you were born into dictate what you will become. During the war, Robin of Loxley was in a deadly bow and arrow firefight. Arrows were flying like bullets in Dunkirk. This scene felt like a scene out of a modern war movie. One of the aggressors had a “Gatling” crossbow that fired multiple shots without having to reload. Robin paid attention and discovered the soldier had to reload after 6 shots. He counted and then made his attack. Without Robin’s attention to this detail, he may not have been able to take out the shooter. With it, he was able to find a weakness. Do you pay attention in your business? Do you see patterns? When you pay attention, you’re able to see things others miss. You will see opportunities that will allow you to progress and grow your organization. The men in Robin’s war unit included some very aggressive men. When they captured the Saracen fighters, they began to execute the men. One of those men was Little John’s (Jamie Foxx) son. Little John pleaded for his son’s life and still the men killed him. This didn’t stop Robin of Loxley from stepping in and trying to stop the execution. He saw what his soldiers were doing as bad. And he knew he had to do something about it. Still, his efforts were futile. He failed to save Little John’s son. But he did what he believed was right and defending another person. Leadership is about putting me behind the we. Leaders know their personal ambitions will only be realized when they’re leading an effective team. This requires leaders to stand behind their team. They have to be willing to show up for their team and defend them, especially when their team wasn’t doing anything wrong. Don’t throw your team members under the bus. Be willing to stand next to them and defend them. But you tried… In all my years of war, I’ve never seen anything like it. Even though Robin failed in protecting Little John’s son, Little John noticed the risk Robin took to try to save his son’s life. Robin’s efforts weren’t in vain. His action during the war allowed him to form a trust relationship with John. This carried over for the rest of the film. You may think failure means the end. That you failed and there’s nothing good to come from your failure. This would be a lie. There can be success, even in failure. Look for the positive side effects of the failure. Did you learn something new? Was a friendship formed? Did someone step up and show leadership potential? You can find something good… Even in your failures. You’re only powerless if you believe you are. Robin questioned Little John’s plan to overthrow the Sheriff of Nottingham. How could two men defeat an army of men? They were powerless to fight, right? Little John didn’t believe so. He believed as long as they believed they could act, they could be successful. Your attitude and mindset impact everything in your life. You can choose to be positive in the face of negativity or you can choose to be fearful when challenges arise. The choice is up to you. Thus, whether or not you’re powerless is up to you. The Sheriff Of Nottingham lead with fear. He told the citizens their city would be burned and pillaged by the Saracen people. They would destroy their way of life. He held the people under his thumb because he led them with fear. They believed him and cowered under him. This went south later in Robin Hood. The people overcame their fear and turned on the Sheriff. You can’t be a good leader and lead with fear. 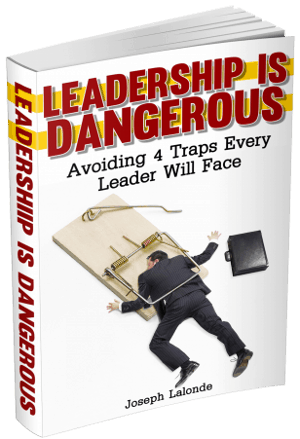 Fear depowers your team to do great work. Instead of making your people fearful, help them to see the possibilities in front of them. There are plenty and you can help them see them. While Robin of Loxley was good with a bow, he needed more training. Little John took Robin under his wing and helped him improve his marksmanship. The training Robin went through was rigorous. He had to run with chains attached to his body. There were intense physical workouts. Then there was the bow-work. Robin couldn’t have overthrown the Sheriff without his training. He also needed a great trainer/coach. Do you have a coach to help you in your organization? You need someone who can look at what you’re doing objectively and coach you through them. There are coaches out there who specialize in specific fields. And you need to find one. They’ll help you take your leadership to the next level. The training improved Robin’s skills. So much so, Robin felt he was ready to take on the evil in his world. This caused him to ask Little John what else he had for training. Being properly trained will help you feel ready for the leadership challenges you will face. You will have confidence in the work you can do. Little John and Robin discussed how to figure out where the tax money was going. Their plan involved Robin working with the Sheriff and other Lords. He would befriend them and work with them. This would gain him access to their secrets. While he didn’t like the people, he had to work with them. You will have to do the same. You cannot and will not get along with everyone in your organization. There will be people who rub you the wrong way. This is life. Life will put you in conflict with others. What you have to do is learn how to deal with these conflicts. Work with people. Even if you don’t like them. Marian and Friar Tuck (Tim Minchin) were talking. Robin overheard what was being said. One of the things Marian mentioned was the money Robin had given to her. She would much rather have the money go to the citizens than her. They needed it more. This changed Robin’s giving. He began to redistribute wealth to the citizens rather than Marian. Marian’s words had power. She was able to influence Robin with what she said. Your words have power, much like Marian’s. You will have great ideas and suggestions. Be willing to speak up. You can share your ideas with those in your organization. They will make a difference. Robin was able to gain the trust of the Sheriff. During one of their talks, the Sheriff shared he was abused by the Lords. He had been beaten. Taken advantage of. Had brooms used on him. This caused him to be angry. You could see his anger and resentment grow as he talked about this. Hearing him share his story, the viewer begins to feel a slight sympathy for the Sheriff. He was a hurt man. And hurt people hurt people. Early in the leadership lessons from Robin Hood, I shared the lesson of being understanding. This could fall under that but I believe it deserves a mention on its own. People who are hurt often lash out at others. They will do things that are inexplicable… Until you hear what’s happened. If you see someone begin to act differently, reach out. See if something is wrong. See if they’re hurt. More than likely, they are. Robin believed his attempt to steal from the treasury was a failure. He escaped but was unable to take any of the money with him. He failed… right? Wrong. His failure brought attention to him. The Cardinal (F. Murray Abraham) was now coming to Nottingham. You may believe something to be a failure when in all reality your failure was a success. Just not in the way you would have thought. If you have failed, see what could be considered a success from the event. You will be surprised. The why of Robin Hood changed over time. He began his crusade to get back home so he could be with Marian. Then he fought to win her back. Eventually, his why morphed into helping people. His why changed over time. He wasn’t apologetic about the change. He owned it. Have you noticed your why change over time? It probably has. And you might not have even noticed. Our whys change over time. As we accomplish more, the why changes. Be okay with this. But also be willing to discover your new why. If the people knew, they would fight… With the right leader. Marian had uncovered a dastardly deed of the Sheriff. He was funneling money to the Arabs. We never truly learn why he was doing this. We do know this wasn’t right. So did his people. Marian knew if the people discovered what the Sheriff was doing, the people would revolt. But they would only do so under the right leadership. The people in leadership positions matter. The right leader can take an organization from bad to good or great. Work to become a leader worth following. I don’t care what you call me, thief or lord, but I am nothing without you. By the end of the movie, Robin Hood realized something. He was nothing without the people behind him. He made this announcement to the crowds. This was to spur on action but to also let them know they were part of the mission. Do you believe you are nothing without the people you’re leading? Without followers, who are you leading? You have to have followers to lead. Know this and make sure you’re recognizing the people who make you a leader. Question: Have you seen the new Robin Hood movie? If you have, what was a leadership lesson you took away? 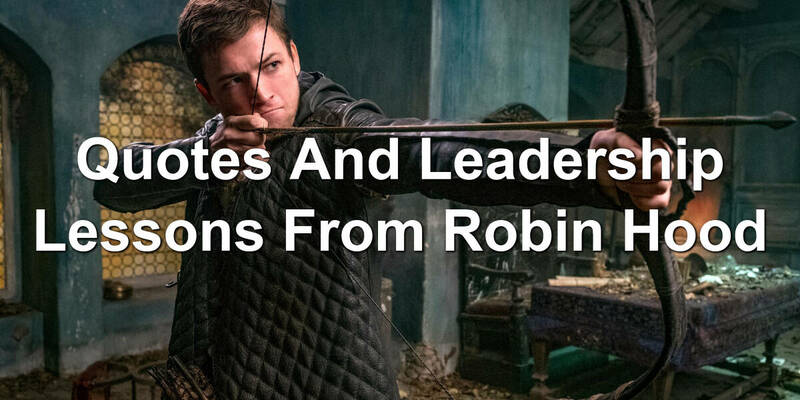 If you haven’t seen the movie, what leadership lesson from Robin Hood that I shared resonated the most with you? Share your thoughts in the comment section below.